I like to mix tuna with beans for simple salads. The tuna provides pure protein while the beans provide a mix of protein and complex carbohydrates. Add olive oil for healthy fat, and hooray, you have a versatile framework for a satisfying and nutrient dense meal. Build upon this basic framework by adding any variety of herbs, spices, or other ingredients. 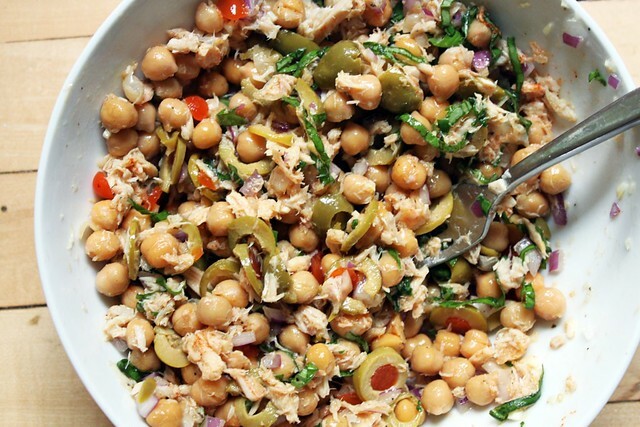 This time around, I combined tuna and chickpeas with green olives, basil, lime juice, olive oil, and pinch of cayenne pepper. If you can eat cheese, a bit of crumbled feta in this salad would be really fab. I served it over mixed baby greens for light and nourishing meal, but it would be great served in a brown rice tortilla or a collard leaf for an easy wrap, or served as an open-face sandwich on a slice of your favorite gluten-free bread. This simple salad is a breeze to prepare and very delicious. Serve as a salad on its own, or scoop over greens or use in a wrap. The high protein content balanced with complex carbohydrates and healthy fat makes this a satisfying and nourishing addition to any meal. And it's affordable to boot! If you have soy allergies, be sure to check the ingredients on your tuna. Many varieties of tuna contain vegetable broth that contains soy. I often buy soy-free water-packed tuna from the brands Genova, American Tuna (BPA-free can), Wild Planet (BPA-free can), or Natural Value (will be BPA-free soon), or from Trader Joe's (BPA-free can). All of these tunas are packed in water and are dolphin safe. Drain tuna and chickpeas, and rinse chickpeas thoroughly. Place in a medium bowl. To prepare herb and vegetables, peel the onion and garlic then mince, and add to bowl with chickpeas and tuna. Slice basil in a chiffonade, then thinly slice the green olives cross-wise to create rounds. Add basil and olives to bowl and toss ingredients together lightly with a fork. Add olive oil, lime juice, and seasonings, stir to combine with a fork, and adjust seasoning to taste. Let sit for 5-10 minutes for flavors to meld, then serve. HINT: if you want to use this as a sandwich filling or wrap filling, I would recommend lightly mashing the chickpeas before adding the tuna and other ingredients. That way, your chickpeas won't roll right out of your sandwich! A potato masher or a pastry cutter works great for mashing chickpeas, as does a fork.